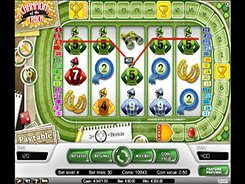 Champion of the Track is a horse racing-themed slot with 5 reels and 30 paylines. 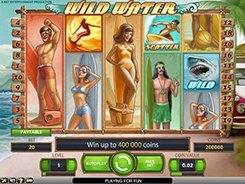 The slot features a wild, a scatter, Career Bonus, free spins, and a bonus game. 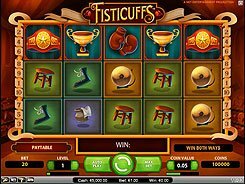 When playing the slot, you can adjust a coin value from $0.01 to $0.5, the number of coins per line (1 to 4), and the number of lines you want to have in play. 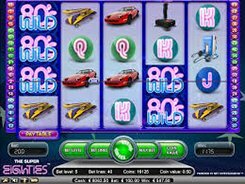 Therefore, the minimum and maximum bets can be anywhere from a penny to $60 per spin. The symbol set includes jockeys, horseshoes, binoculars, trophies and stopwatches. The largest award of x10,000 times a bet (up to $20,000) is granted for hitting five wild symbols across a bet line. You will see a Career Track around the reels. Three or more Trophy symbols unlock a Bonus Game where you can win up to four ‘career steps’ and decent cash prizes. If you advance through 20 career steps, you receive the Champion of the Track award. What’s more, your progress on the track is saved for two days after your last gaming session, so next time you load the slot you will not have to start over at the beginning. Finally, there is also a free spins feature with 10 free spins at a x2 multiplier.